Several pieces on this Sunday, March 3, 2019 MetWinds Winter concert program at 3 pm in Lexington represent rides of one kind or another. Fillmore's The Klaxon March suggests the horn of early automobiles; Ticheli’s Blue Shades takes us tearing through the land of the blues; "Gandalf", from de Meij’s Lord of the Rings represents a ride on his gallant steed Shadowfax; and then there is Michael Markowski’s Joyride. Not only is this last piece a superb work, but Markowski wrote it just after graduating from high school! Rounding out our program will be Frank Ticheli’s gorgeous arrangement of Amazing Grace; another wonderful piece by Cambridge composer John Mackey, Kingfishers Catch Fire; and our second member soloist of the season, Robert Howe, performing Donizetti’s wonderful Concertino for English Horn. Originally written for orchestra, Music Director Buckley has transcribed it for winds especially for this performance. Lewis Buckley earned his undergraduate degree from the Eastman School of Music and his Master’s degree from Connecticut College. In 1975, he became the United States Coast Guard Band’s fifth director at age 27 and held that post for 29 years. He continues to compose, arrange, and publish music. He also remains an active trumpet soloist, frequently combining solo appearances with conducting, often in premiere performances of his own commissioned works. Buckley has a diverse background, having conducted bands, orchestras, and choruses in all styles of music from classical to commercial to jazz. Now in his twelfth season with the MetWinds, Mr. Buckley has served them longer than any other music director. Soloist Robert Howe has played oboe and English horn with the MetWinds since 2014. Howe has earned undergraduate degrees in Chemistry and Music, an MA in Music and an MD from UConn. Howe has played oboe and related instruments in many community and professional ensembles including the Delaware, Springfield (MA) and Toledo (OH) Symphonies, the Connecticut and Montreal Baroque Festivals, the Arcadia Players and the Northwest Connecticut Band. His proudest musical moments include playing Sibelius’ Swan of Tounela, a tone poem for solo English horn and orchestra, at New York’s Carnegie Hall and performing the Bach Double Concerto for oboe and violin on modern oboe and baroque oboe in consecutive seasons. Founded by Jerry Gardner in 1971, the Metropolitan Wind Symphony, a concert band, is currently celebrating its 48th anniversary. MetWinds comprises over 70 talented woodwind, brass, and percussion instrumentalists who audition for membership and seating. 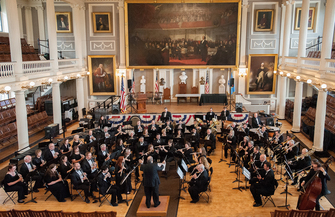 It makes a significant contribution to the cultural life of the Greater Boston community by providing its audiences with high quality concerts and its members with opportunities for musical growth. The concert will be held on Sunday, March 3, 2019 at 3:00 pm, at the Scottish Rite Masonic Museum, 33 Marrett Road, Lexington, MA 02421. MetWinds Music director Lewis J. Buckley will conduct the program. Mr. Buckley will deliver a pre-concert lecture at 2:30 pm. Tickets are $18 for adults, $14 for seniors, $6 for students, and are free for children under 5. They are available at the door or can be reserved by telephone. Parking is free. Call the MetWinds Concert Line at (978) 419-1697 to reserve or purchase tickets. Visit the MetWinds web page at http://www.metwinds.org for information and directions. Email mws@mws-boston.org with any questions. This and other concerts by MetWinds are funded in part by the Massachusetts Cultural Council and the National Endowment for the Arts.